Oh wow! What happened? Where am I? I must have fallen asleep there for a minute – I’m so embarrassed. I had the weirdest dream; I was on a beautiful island in the Caribbean and some people got married, and then my sister got married, and there was an earthquake and a hurricane in New Jersey. Crazy! I have the most ridiculous dreams, like a combination of a Wes Anderson movie and a Dr. Seuss book. But I’m so sorry I dozed off right in the middle of our conversation. How long was I asleep, anyway? And what were we talking about? Oh right, food. Southern food, wasn’t it? 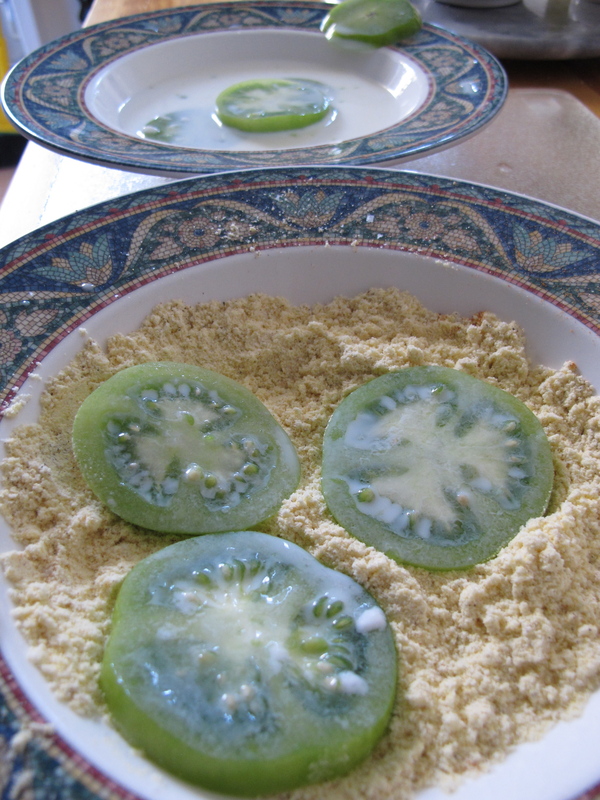 So, what do you say we make some fried green tomatoes. The Union Square Greenmarket is retracting, its seasonal pullback from the voluptuous abundance of summer produce into its leaner cold weather rendition. Tables covered with peaches and strawberries and heirloom tomatoes have been replaced by piles of winter squash, apples, pots of chrysanthemums, and the early cruciferous crops of the season. 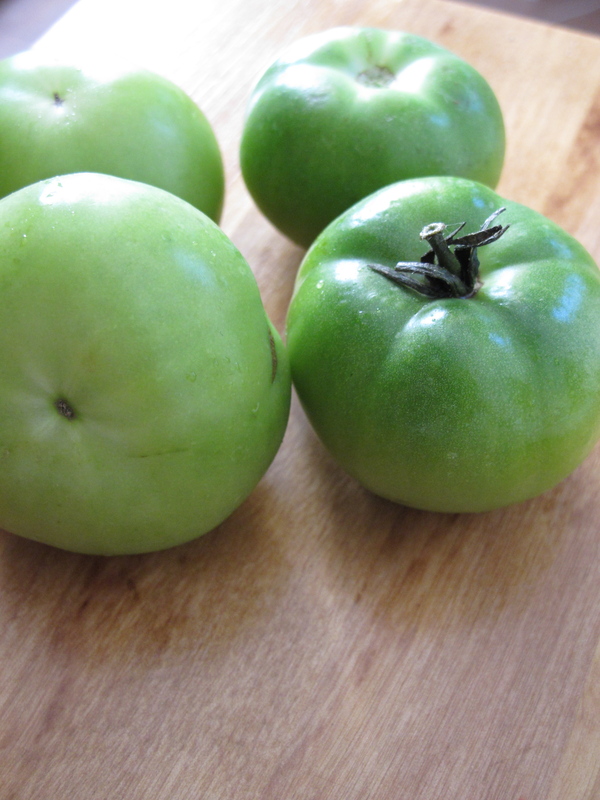 It’s a great time to get green tomatoes; earlier in the year, everyone is too desperate for the first juicy ripe tomato to pick any while they’re green, then we revel in the abundance of the season until we realize that it’s getting toward September and the end of tomato season and the urge to “enjoy them before they are gone” takes over. But now it’s time to strip the vines of the last tomatoes that won’t have time to ripen before the frost and enjoy the unique berry tang of the unripe fruit. 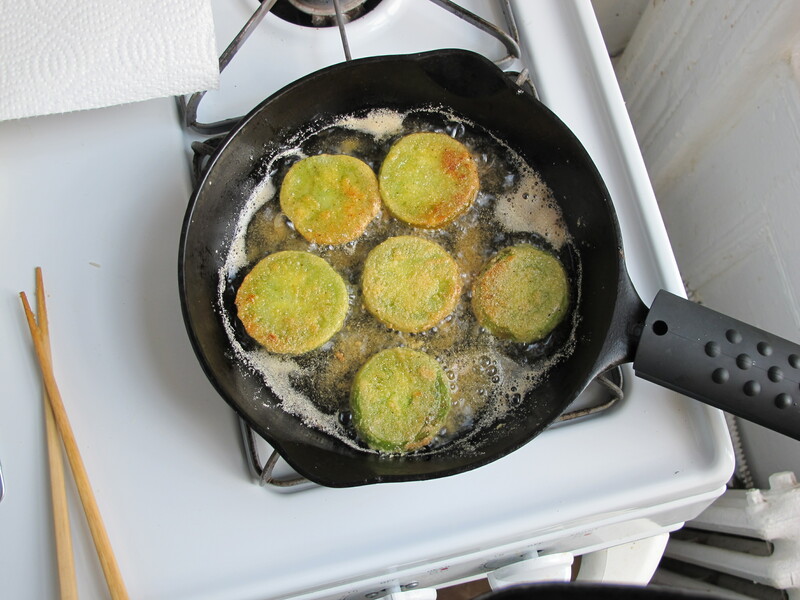 When it comes to frying vegetables, there are a few things I get a little strident about: first, I don’t like a tiny nugget of the vegetable buried in a heavy batter or breading. 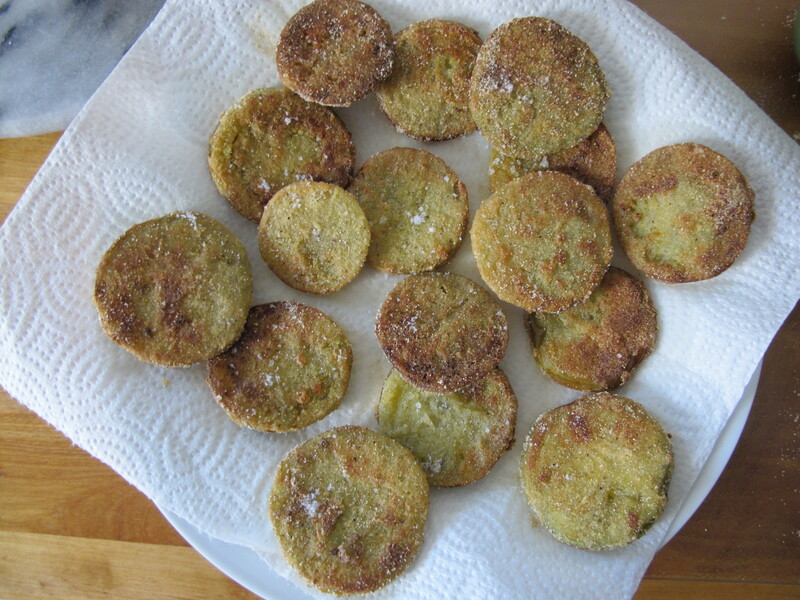 I love fried okra, but when I eat fried okra, I want to taste a lot of okra, enrobed in a gossamer -like crust, not a greasy chunk of dough with a miniscule piece of okra buried in its depths. Yeah, maybe I’m being a little hyperbolic, but you get my point. Second, I don’t like the grittiness of cornmeal when I fry. It’s a personal preference, or course, but I don’t like feeling like I’ve face planted into the beach when I’m chewing my food. Corn, however, fries very nicely without some of the sogginess problems that can happen when frying something very watery in a flour dredge. If you’ve ever had fish and chips where the interior of the crust is gummy, it’s because the liquid in the fish released as the fish cooked and mixed with the flour in the batter before the flour had time to cook. Wheat flours, or flours that contain gluten get sticky and gummy when they absorb liquid. If you can control the temperature and moisture level of what you are cooking, this won’t be a problem, but for quick simple pan frying, gluten-free corn is easier to control. Corn has a nice flavor and crispness too, ideal in contrast to the tender fried vegetable inside. In order to use corn while not having that gritty crunchy feeling I dislike, I use corn flour, a ground corn that falls between a “meal” and “starch” grind. The fineness of corn flour’s texture enables it to cling easily and cook quickly. Third, I very rarely go deeper than a pan fry. Deep frying is usually just too much trouble for me to do, especially considering that the only ventilation in my kitchen is a window next to the stove. Shallower pan frying is much easier to manage. It’s easier to adjust the temperature, control the mess, and clean up afterward. Generally, on the rare occasions I eat deep-fried food, I leave it in the hands of a competent professional. So, for fried food, I use my cast iron skillets and enough fat to come about halfway up the sides of whatever I’m frying, then turn it halfway to fry the other side. Rather than share an actual recipe with specific measurements, I’m going to list the ingredients and general amounts I made, then explain the technique I use to fry green tomatoes. Rough measurements work best, because the amount of dredge and fat used is dependent on the amount of tomato to be fried. Line up two shallow bowls (something like a pie plate works well) on the counter. Put the buttermilk in one and the seasoned corn flour in the other. Dip each slice into the bowl of buttermilk, shake it to get any big drips off and then into the corn flour dredge. I like to use chopsticks to flip the slices over to evenly coat each side. It keeps my fingers cleaner because I can never remember the whole “one hand for liquid, one hand for dry” technique. Tap the edge of the tomato slice to get any loose dredge off; the loose corn flour will just end up falling off into the hot fat and burning, kind of inevitable, but this will help minimize that problem. When you have a pan-full ready, heat the skillet over medium-high until the fat begins to shimmer and the first wisps of smoke appear. While the first batch turns golden on the bottom side, start dipping and dredging the next batch. I use chopsticks again, or a small spatula to lift the edge and check the bottom. 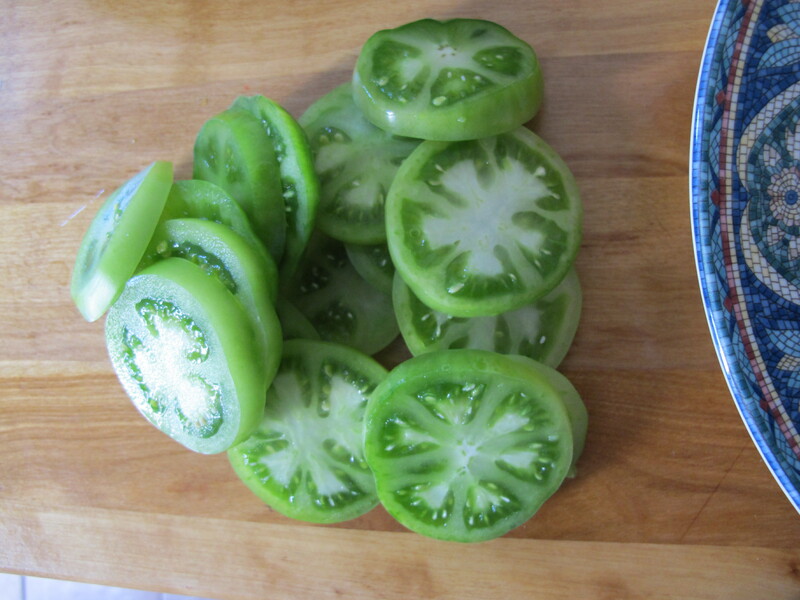 The green tomato skin on the edges will begin to lose some of its vibrant color and turn a more olive-green. Flip the tomatoes and cook the other side. Remove to a paper towel- lined plate to soak up any excess fat and quickly add the next batch to the pan. A sprinkle of sea salt is a minimal final flourish to finish this simple dish. We ate it for brunch with grits and eggs, which is not a bad meal to which to awake. PTL; it’s WONDERFUL to once again hear your voice on screen! 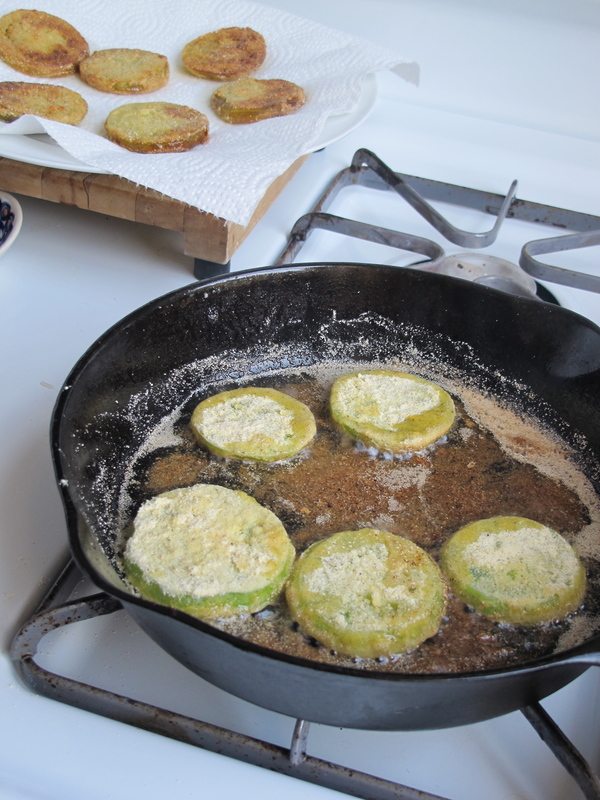 Fried green tomatoes — as always a beautiful job. wow ! I am so glad to be able to read you again. I loved the last line “which is not a bad meal to which to awake”. We have some green left on the volunteer vine out front that I now want to fry! Proud to be Southern. ILY. Copyright © 2013 CognitiveLeeks.com. All rights reserved.